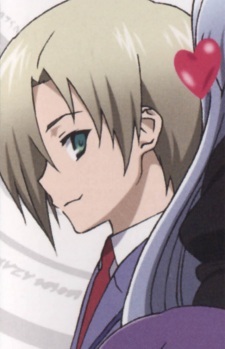 Kirihito first appeared in episode four where he helped save Elis. From then on, he appears in other episodes helping to save Elis and locate the jewels, but he tries not to draw too much attention to himself. In the 9th episode, he rescues Elis when Anzelotte orders her followers to kill her. In the 12th episode, Kirihito reveals himself as Anzelotte's God, Gazer, and the mysterious Oji-sama who promised to meet Elis on her 17th birthday. He uses Elis and the seven jewels of virtue in attempt to awaken Syaimaral and destroy the Earth. However, Hiiragi is able to team up with Elis to kill him.